We welcomed 2011 in at the farm - Euan had great fun entertaining everyone and eventually went to bed at about 2.30am!! The big news for this month is that Euan has started attending Invergowrie School nursery in the afternoon 3 days per week. He has settled into it really well although he did have a little mishap the first week. This neccessitated a trip to A & E at Ninewells for a gash in his chin to be glued back together. In true Euan style he was not the least bit fazed by this!! Mummy and Daddy were allowed a little treat at the end of the month - they went to the cinema together for the first time in about 5 years whilst Euan had a fun day at the farm with Fay and Angus. Most of our snow had disappeared by February - the novelty of it had worn off! Euan was a little poorly at the start of the month...we think with something called 'slapped cheek' virus. He was rather blotchy and itchy for a few days, and the snotty nose was a thing of wonder. Thankfully he was back to normal within a week. Auntie Margaret came to stay for a weekend. We had an entertaining bus journey home from Dundee. (Margaret had to guide the driver to turn round in a field gateway after he took the wrong route). The weather wasn't great but we managed a visit to Perth to check out the museum. Euan had great fun there running about, using interactive displays and trying on a few costumes. On the Sunday we went for swim before going to the farm for fish pie and pavlova cooked by Fay and Angus..delicious! Neither Mummy or Daddy managed to make any pancakes for Shrove Tuesday, but Euan didn't miss out...he had more than his fair share at Karen's house. We think the squirty cream on top was the real attraction!! Good news for Mummy this month too - after ten years of hard work, she is finally the proud owner of a BSc in Geosciences! What an exciting month April has been starting with the car getting it's annual wash before going for MOT. Euan very kindly helped with the washing as can be seen in the photo. Euan had his first experience of canoeing and camping. We spent two nights at Aberfeldy. Unfortunately the weather was a little damp on Saturday morning but we still managed to have fun. When we went to Loch Tummel at the end of the month the weather was much better, as can be seen in the collection of photos from the two trips. The weather has been pretty good this month and we had the first BBQ of the month on the 16th. First of many, we hope. Euan particularly enjoyed the accompanying potato salad. We popped down to the farm in the middle of the month so that Mummy and Euan could accompany Uncle Brodie, Fay and Angus to the Links market. We had a fantastic time, I think Euan is going to be a big fan of fairground rides. Euan had his pre school boosters this month! Daddy took him along to the surgery for the injections, they were both very brave. We have been planting vegetables again this year - potatoes, onions and peas are in the ground. Euan is very keen to use the hosepipe for watering duties. Since Euan has outgrown his tricycle we decided to buy him a 'balance bike' - he is beginning to get the hang of scooting along and lifting his feet up.... but of course it is always easier to as Mum or Dad to give him a push. We had visitors at the end of the month - Grandad and Flor were home from Thailand for a few weeks. Euan was delighted to see them, even making cards at Karens house to welcome them home. We spent a couple of days on Speyside with them. We had a little journey on the steam train again and had a blustery time in Aviemore, but it was great fun. Another fairly hectic month - although summery weather has been in short supply. Euan went to see the scarecrow display in Longforgan with Karen this year again. He seems to have got over his fear of them!! There were some clever desings including 'Oor Wullie' and Spud the Scarecrow from Bob the Builder stories. For his end of term treat at Invergowrie Nursery, Euan went to see the 'Sticky Kids' show in Perth. He enjoyed Molly Muddle and her antics, and also enjoed the picnic afterwards, which Daddy joined him for. Mummy was lucky enough to win tickets for the Highland Show, so Uncle Brodie kindly collected Mummy and Euan and off we went. It was a super day out, especially with almost all of Euans cousins there too. Euan really enjoyed taking pictures of the cows with Auntie Margarets camera and was not worried in the least about being in close proximity to such big animals. We went down to Belford Granny's at the end of the month. Mummy's graduation ceremony was in Gateshead, so Euan kept Granny and Jack amused whilst Daddy, Mummy and Auntie Margaret went to the ceremony. 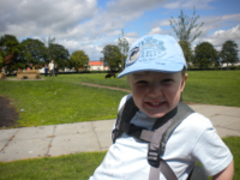 A big adventure for Euan this month - he went to stay with Belford Granny without Mummy and Daddy. He had great fun there, although setting an alarm for 02:00 had been a surprise for Granny and Jack. For our summer holiday we spent a few days camping at loch Tummel again. It was a little cool but flat calm for canoeing. Euan put his water pistol to good use in the boat. We had a barbecue at the campsite, Euan tried unsuccesfully to catch a duck to cook on it. We made the most of the good weather to have an outing to Tentsmuir forest. Whilst Daddy went surfing, Euan and mummy went for a bike ride - we saw lots of dragonflies and a red squirrel. After a picnic lunch, Daddy and Euan did some dam building on the beach whilst Mummy went for another bike ride. An active start to August - Euan started swimming lessons at Perth pool, then a few weeks later at Dundee pool too!!. He appears to be enjoying then and participates with enthusiasm. One sunny Sunday we had a visit from the Wallace clan. Daddy and Uncle Brodie went off to do a wine tour at Cairn O' Mhor while the rest of us sat out in the garden. We had a tasty buffet tea and Euan and his cousins had great fun playing with a large cardboard box!! At Teddy Club nursery, Euan has moved up to Oakleys Explorers...his last nursery class before school. We had his group bear, Fern, home for a weekend visit, which was tremendous fun for everyone. Euan is also back at Invergowrie Nursery. He made us giggle by saying that the 'little ones' weren't starting until a week later. He must be one of the big boys now!! It was Errol Show at the end of the month. Only a 3rd for Mummy's clootie dumpling this year, but a 1st for the sultana cake..yum yum!! Belford Granny came to stay at the beginning of September. We had a visit to the Dundee food and flower festival. Euan had more sucess with his entry than Mummy did with hers, winning first prize for his model tree made from recycled materials. We also had a little holiday in Dumfries and Galloway this month. The weather wasn't brilliant but we made the most of it. Daddy got some windsurfing done, which kept him happy. We went to Mabie farm park where we had fun on the go carts. We also had a visit from Mummys friend Susie when we were on holiday. Euan was delighted with the tractor she brought him as a present. Daddy had good news this month, passing his OU course about Linux with a result of 74%. We had a little visit to Belford to wish Granny a happy birthday, before travelling back up to pay a flying visit to the farm. Euan was fascinated with Uncle Brodies combine. Euan is still enjoying his swimming lessons and is getting more confident - even practising his star floats in the bath! Into Autumn and back to being wrapped up for the cold, dark mornings. We celebrated Daddy's birthday this month..we won't mention how old he is!! As a treat, Euan and Mummy took him to the pub for lunch. We all enjoyed this but Euan especially enjoyed his 'cocktail' (fruit juice). Shetland Granny came to stay for a weekend. We had good fun and Euan was fascinated by her funny toenail!! We also saw Helen and Oliver when we took Granny back to Uncle Brodie's. Euan and Oliver had great fun playing together. Euan had a couple of Halloween parties but wasn't too keen on dressing up. However, he did wear his hat and mittens to turn himself into a cat. He was very keen on the games though...dooking for apples etc. Daddy hasn't been very well this month..he is getting bored with taking antibiotics...hopefully he will be on the mend soon. Daddy is still recovering from his nasty infection but thankfully much better than he was and at least his ankles are back to their normal size! Euan took part in a cupcake event for 'Children in Need' This was organised by childminder Karen and raised more that £120. Euan enjoyed eating the cakes almost as much as decorating and selling them! The 25th November was Euans 4th birthday...he had several birthday cakes! He also received lots of lovely presents and cards. Belford Granny and Gillian came to stay for the weekend and had great fun playing with some of Euans new games. We had a 'birthday buffet' on the Sunday afternoon. Quite a breezy start to December but thankfully no snow. Euan was very busy with preparations for nursery nativity plays. He thoroughly enjoyed practicing his Christmas carols - often to the amusement of others on the bus!! At Teddy Bear Club Nursery, Euan was a sheep in the nativity play - obviously Euan acted this out with his usual nonchalance... Santa arrived a little early in our household but everyone was delighted with their Christmas gifts...although it remains to be seen if the drum kit was a good idea. On Christmas morning we were up bright and early to travel to Newcastle airport on the first leg on our journey to Thailand.